Majestically situated on a cliff overlooking the Loire, the Château d'Amboise provides fabulous views and a glimpse into a royal past. The Château d'Amboise is truly striking, rising high above the Loire and the charming town of Amboise. It's fun and easy to visit and has a long and storied history. The stunning château is best seen late in the day from across the river, when the sun turns it golden and glorious. A visit is excellent at any time of day. You walk up a large ramp to the entrance and continue up to the terrace, where there are fabulous views of the Loire and the rooftops of the town. Flags decorated with fleurs-de-lys, a symbol of French royalty, flutter in the breeze. Stroll around the terrace and you'll have plenty of photo ops. The small Chapel of St-Hubert (patron saint of hunters), is a fine example of Flamboyant Gothic architecture from the late 1400s. Today it is best known as the reputed site of the grave of Leonardo da Vinci (left), who died in Amboise in 1519 in the nearby Château de Clos Lucé. Inside the château you visit a number of rooms, from the large Council Chamber, where the King met with dignitaries and held festivities, to the bedchambers of the various kings who slept here. The Cupbearer's Room features 17th century tapestries and tables. Amboise was home to many kings but is perhaps best known as a favorite place of François I, who spent his childhood here, and Charles VII, who died at Amboise at age 28. But it's really the exterior of Château d'Amboise that is most exciting. Climb the spiral staircase up the large Minimes Tower and enjoy the views of the Loire, the town of Amboise, and the lovely gardens. Descend through the Cavalry Tower and picture horses and carriages entering the château up the wide ramp. Château d'Amboise also offers a delightful Sound and Light Show a couple evenings a week during the summer season. With a large cast of adults and children from Amboise and the surrounding villages, the show transports you to the court of the King, complete with horses, fireworks, and an appearance by Leonardo da Vinci. In season, you can also visit the underground passageways and towers of Château d'Amboise, with group guided tours offered several times a week. Château d'Amboise is known more for its architecture and its dramatic position and views than for its furnishings. 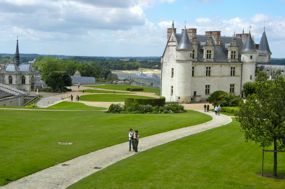 If you want to see elegant furnishings, you might visit nearby Chenonceau, or travel a bit farther to Blois or Chambord. 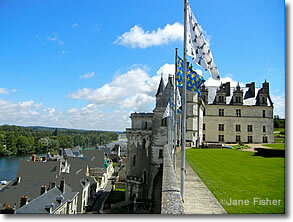 Château Chaumont, just 20 kilometers from Amboise, also offers commanding views of the Loire. And while you're in Amboise, you can also visit the Château du Clos Lucé, where Leonardo da Vinci spent his last few years. It's just a short walk up the hill from the Château d'Amboise. Above, Strolling around the Château d'Amboise, France. 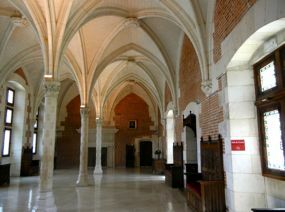 Below, Council Chamber, Château d'Amboise. Above, Château d'Amboise and rooftops of town seen from the Château.